I have been using bee venom for my lyme for about three years now. It has been an absolute staple in my treatment process and I wouldn’t give it up for the world. The benefits I receive from this therapy are extraordinary and I am also able to be autonomous in my use of the therapy, meaning free from the medical system to use it. Bee venom is active against the spirochete that causes lyme, the protein called mellittin is the active agent that makes this natural remedy an antibacterial, but the benefits for people with the lyme complex doesn’t stop there. The most prominent benefit I personally receive is the extra energy the venom gives me. I like to call it nature’s crack because It helps with fatigue so much! It is a potent painkiller and natural anti-inflamatory which is obviously helpful for the pain and arthritis symptoms that lyme can cause. It is also reportedly a natural mood elevator and has antidepressant qualities. All around this therapy is 100% worth the energy it takes to get set up and start using it. The set up is what takes the time, but once you train yourself and have your supplies you are free to treat yourself indefinitely. It is also feasible to maintain long term treatment with venom because it is not harmful to your system, unless of course you are allergic to bee venom. I am not a physician and am not giving medical advice, this is simply information that I have acquired in my personal journey through lyme disease that I hope will be useful to others. What is involved in starting Bee Venom therapy? 1.Read about it and educate yourself! You must carefully and gradually ramp up on the dosage, it is a process. 2. Find a physician, natural or allopathic, who is willing to go through the initial process, prescibe it for you, test against allergy, and teach you how to inject yourself. This also means you need to be able to inject yourself (have the stomach for it) or have a loved one who is willing to learn it and do it for you three times a week. I much prefer to be self sufficient and do it myself! It is much more convenient this way in the long run. 4. Get on a schedule three days a week. I did Monday, Wednesday, and Fridays. Make sure you have the manual from www.beevenom.com and learn how to slowly ramp up with one bee sting up to five, and properly mix the venom and procaine or lidocaine. You must obtain the venom, you can do this using live bees and maintain a hive so they are available to you. This route circumvents the medical system entirely, but it is a timely and energetic endeavor, and it is painful! I personally obtain my venom from a harvester who is an expert in his field. You can check out his website and get the venom from www.beevenom.com. The venom is harvested and put into homeopathic remedy viles which you use a needle to draw your venom from. You do need a prescription for your first order, that way the doctor can test you against an allergic reaction, and safely prescribe you the venom. However, once you obtain your prescription and KNOW you are not allergic, you can be taught to give yourself the injections. I asked my pain management doctor if he would be willing to do all of this for me several years ago, and because I have been in so much pain, he agreed to try this alternative therapy on me. When you do the injections, you mix the venom with a numbing agent called lidocaine or procaine, which must be preservative free. You need a script for the venom, numbing agent, and for the needles. You also need to purchase pure acetone from a beauty supply store like Sally’s. You clean your skin and the bottles before injecting the venom with acetone because alcohol will render the venom inactive and it cannot be used. 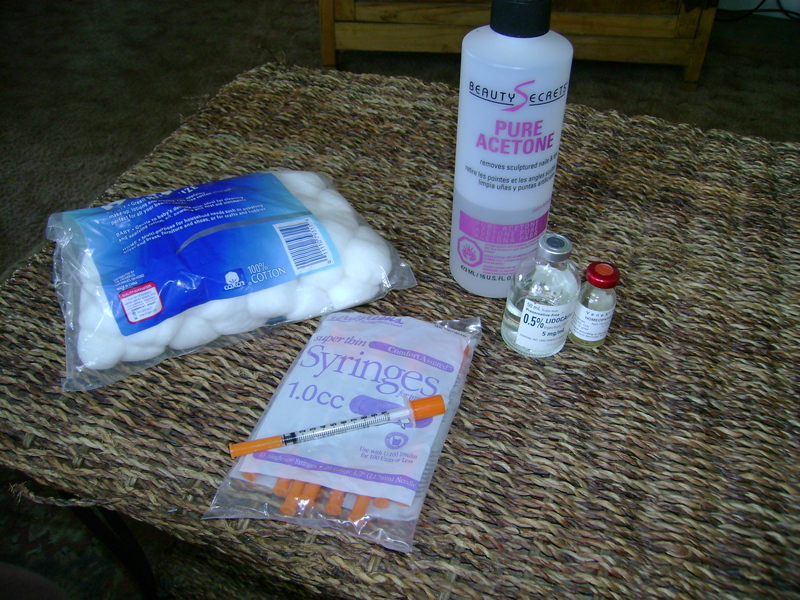 The doctor you choose can teach you how to do “subcutaneous” injections on yourself. The needle is very thin and is inserted just beneath the skin, to me it is relatively painless procedure. If you have lyme brain and fatigue, this may seem like a lot, but once again I tell you, from my experience with this natural remedy, it is worth it. I believe this therapy has played a role in keeping the degeneration that lyme can cause at bay in my system, and it has helped me to maintain a better energy level. I can accomplish more and get a boost of energy if I am really fatigued. At first, I did the injections three times a week, and now I do them twice a week as a maintenance program. This sounds excellent and something I might want to try however, the use of acetone really surprises me. That isn’t toxic?? hi Jennifer, no it’s not toxic because it is only used to topically in small places. I have used it for years and it has not hurt me! It’s peanuts in the whole process really. I see this is an older post, but Id like to comment anyway. From what I have read to-date, supposedly the bee venom injections are not strong enough to kill lyme and will only treat symptoms. Dr. Klinghardt has stopped the injections because they are not as good as the real bee stings (and they can be costly). Ellie Lobel went from being, literally, in her death bed … To being *cured* of Lyme and co-infections. It took her 2 1/2 yrs of stinging. She is healthy now. The venom killed the infections. She has a YouTube channel under her name: Ellie Lobel. And she also has a facebook group called: Bee Venom for Lyme Disease USA. She has her protocol listed under the Files section of the facebook group. Another worthwhile facebook group is Nancy Cleek Dolan’s: Bee Venom for Lyme Disease. Both Nancy and Ellie were near dead after 20 yrs of Lyme. Nancy had spent over $1.5 million on treatments and was dying with a diagnosis of Non-HIV-AIDS. She has MS, Parkinson’s, and had lost the ability to read. Ellie was in congestive heart failure, organ failure, had Been diagnosed with RA, MS, Lupus, and was seizing all through her day. They are both WELL now. It takes 2 straight years of stinging 3 times a week, 10 stings every time. Less will NOT kill the lyme. More can cause damage to your body. You must slowly work up to 10 stings per session. The herxing during the first year is Hell, but you have to go through it if you want to be Lyme free. And you can, literally, be cured of the lyme. … It takes 3 years to kill Bartonella. They say that Babesia, mycoplasma and Epstein Barr die faster than Lyme, Bart, or Herpes. I know someone who killed her Q-Fever within 7 months of stinging. … I have the ‘Fry Bug’ (protozoa) and I am killing it with venom. I am only using Venom. So far I am 7 1/2 months in. … If you have lyme – start stinging – and then stop for more than 3 or 4 wks – you may have the Lyme change your body chemistry and make you have anaphylaxis when you start back up again. So, you must try not to stop after you have begun. After the first year you should feel pretty well most of the time. Ellie killed her Lyme with ONLY the real bee venom from bee stings. Others have reported curing Polio, and other illnesses, with the potent, real venom. It’s not easy… but it works – and it won’t cost much. I have been collecting my bees from bushes outside for free. I just purchased the needed reverse tweezers, and some Tupperware to catch the bees with. It is saving my life!